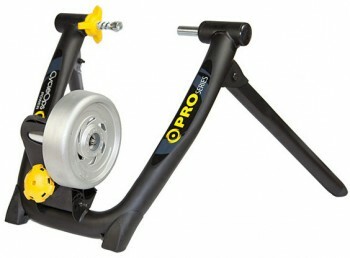 The PowerBeam Pro is CycleOps’ top of the range high-end bike trainer. It is their only electronically controlled trainer in their range, and thus their only trainer that can be controlled wirelessly and connected to external devices, such as a PC. This trainer is suited to the more serious cyclist. The CycleOps PowerBeam Pro comes with PowerTap, which uses strain gauges mounted in the resistance unit to measure the power generated. This is a very accurate (perhaps the most accurate) way to measure power output. 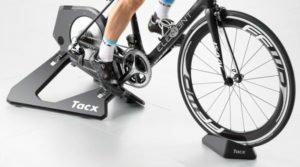 The PowerTap technology allows you to control power levels precisely from 30 watts to 1000 watts, or if you are happier with units of incline, this is equivalent to a 10% incline. This trainer comes with a PowerBeam Pro console and the PowerAgent 7 software. With these you can adjust and control all your workout parameters as you cycle, and you have a full ride download capability and analysis options so that you can assess post-workout parameters such as critical power, heart rate, cadence, and speed. As you workout you can set conditions based on power range, incline, or target power. Before you start your trainer workout you can upload sessions from the PowerAgent software to a Joule GPS unit (optional extra). This GPS unit then controls the resistance and power settings of your workout automatically as you ride. You can see in real time on the GPS display your current power output, heart rate, cadence, speed, energy expenditure, along with ride times and distance. Included with the CycleOps PowerBeam Pro turbo trainer is a special trainer skewer, a power supply, and a speed/cadence sensor. The Joule GPS is an optional extra. CycleOps have a new VirtualTraining software that allows you to ride on video courses and compete against other riders. The PowerBeams resistance is automatically altered to the terrain you are riding (i.e. when you go up hills your trainer becomes stiffer). The video below shows the CycleOps software in action.